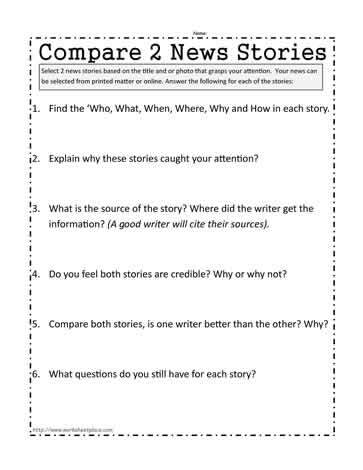 Middle school media literacy worksheet to compare news stories. Find the ?Who, What, When, Where, Why and How in each story. Explain why these stories caught your attention? information? (A good writer will cite their sources). Do you feel both stories are credible? Why or why not? Compare both stories, is one writer better than the other? Why? What questions do you still have for each story?